It came late in the day but the big story in the FX market today turned out to be North Korea’s idiotic decision to fire “a few missiles” over Japan. President Trump has yet to respond, but he’s certainly not going to be happy with their actions. USD/JPY has tanked in response and the move has taken all of the yen crosses down with it. These renewed tensions will most surely cause widespread risk aversion and not only does USD/JPY look poised to test its August low of 108.60 but if Trump responds with more than harsh words for North Korea, we could see 108. We have chosen to sell NZD/JPY because risk aversion has an enhanced impact on the pair especially this time around as tensions center on the Asia Pacific region. New Zealand has its own troubles with weaker growth and a central bank talking currency intervention. There are also no New Zealand economic reports on this week’s calendar to threaten the downtrend in NZD. 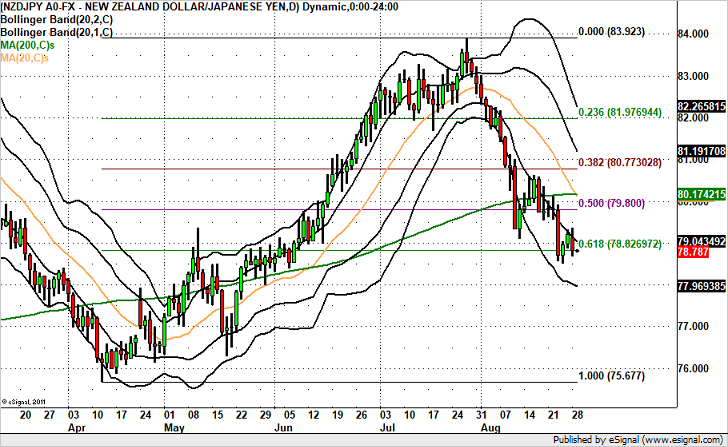 Technically, NZD/JPY is in a strong downtrend. It just broken below the 50-day SMA on the weekly chart and is at the cusp of breaking the 61.8% Fib retracement of the April to July rally. At minimum we expect NZD/JPY to test its August low of 78.50 but taking a look at the weekly chart, risk aversion could send the pair as low as 77.75.